On Saturday night Irish stand-up David O'Doherty was announced as winner of this year's If.com comedy prize - formerly known as the Perrier Award - at the Edinburgh Festival Fringe. Four acts were shortlisted - Kristen Schaal and Kurt Braunohler together, plus Rhod Gilbert, Russell Kane and O'Doherty. 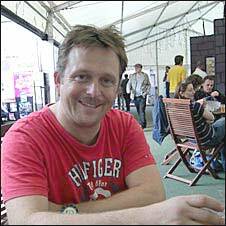 In 2007 Tom Binns was nominated for his spoof hospital radio DJ act, Ivan Brackenbury. He explains what it was like to be in the running for the prize, and how his life has changed in the past 12 months. Last year my aim was to let the world of comedy know that I was back in stand-up as this character. I'd been abroad, skippering a catamaran. My aim was solely to get gigs in clubs around the country, which was why there was very little story or plot going on. It wasn't necessarily an Edinburgh show - it was just lots of jokes. I hadn't really thought about the award. I hadn't been to Edinburgh for 14 years. I knew vaguely that it existed, but I thought it was still called the Perrier. I genuinely was just here to announce to the world that I'd got this act. I missed all the clues - and all the clues were there. For example, after the longlist had come out, I still had judges in the audience. All of a sudden there were two camera crews following me around. They'd been tipped off that I was going to be on the list, but again I was quite naïve. I really had a great Edinburgh and far exceeded my expectations, so I kept saying I wasn't bothered. They were getting really frustrated by it and I didn't realise why. That was great. So effectively I won best newcomer, although [actual winner] Tom Basden doesn't like me going around saying that. And actually I only go around saying that to nark him. The other nominees weren't so relaxed about being shortlisted. Brendon Burns - who'd been coming to Edinburgh all his life - and Andrew Maxwell took it so unbearably seriously. But I guess in my heart of hearts I didn't think I was going to win and I was just blown away to be nominated. I went to the announcement on the Saturday night, but I was utterly nonplussed. It wasn't nerve-wracking. I just went along and had fun. My heart didn't even skip a beat when they did the announcement. I think when Christian Slater read the nominees out, he even did a wink to Brendon Burns when he said his name. So it was obvious, even before it was announced, that it was Brendon's gig. The crew from ITV who were filming us said, 'Yeah, we didn't understand it. We saw them all discussing it and they said, 'obviously Ivan Brackenbury is the funniest show, but who do we give the award to'? All of a sudden I felt disappointed about this competition I'd had no interest in. I got a gig in the West End out of it, and that was all right, but it was such a big theatre that there wasn't as much of an atmosphere as I was used to. But I got money from If.com towards my tour, and I put up their posters, and that was great. How has life changed? Well, about an hour ago I found out I'd sold every single ticket for my run at the festival, so I'm sure that's got a lot to do with it. I do have a character which does lend itself to being on a lot of television and radio stations - it appeals to people in the industry - so I guess that helps. Also now I get asked to do all these big Best of the Fest-style gigs. But it's difficult to say what success over the past year has been down to winning the award. Do they choose the best acts, or do they pick the five people most likely to be successful next year - who were probably going to be successful anyway - and then take a bit of credit? I really don't know which way round it works. 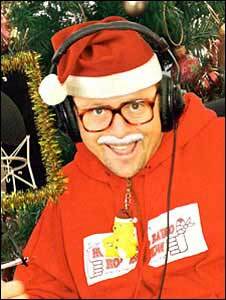 Ivan Brackenbury's Hospital Radio Christmas Show runs until Monday at the Pleasance in Edinburgh.